Today I'm sharing some Christmas cheer with Road Trippin' Santa from High Hopes Rubber Stamps. The sentiment is Holly Jolly. I have so many Christmas cards to get out this year I'm trying to get as many done before Fall as I can. Gives me more time for Christmas shopping later lol. Thanks for popping in today. Have a wonderful day! Today I'm sharing the High Hopes Haunted House with you. 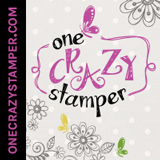 I really enjoyed coloring this adorable background stamp. I know I've said this many times before but Halloween images are my favorite to color, it must be the colors lol. Thanks for coming to peak at my card today!! Today I'm sharing a birthday card I have made for one of my 3 brothers. October is a very busy month in our family for birthday's so I had to get a head start. This particular brother loves everything animals...gee he even feeds the squirrels at his condo. So I think this card will be just perfect for him. I didn't want to be too froo froo if that makes sense, so no ribbon or enamel dots just some wood embellies that I had on hand. I colored the sun in the background first....of course I notice AFTER the image is all colored that the sun appears to be an oval shape not round....dah me. I thought oh well we are going to go with it anyway after all that coloring & besides I don't think my brother will even notice. He will be too excited about the wood embellies anyway. Today today I am back with another Halloween card. This time I am using Standing Witchy Poo with Kitty from High Hopes. I popped this little cutie up on a wobble so she jiggles. I have had this Halloween ribbon in my stash for a long time just waiting for the right card to use it on. I added some Black Gumdrops and another piece of black ribbon to finish it off. Wow can you believe it's August already?! It's time to start getting the Fall/Halloween cards ready to go. I personally LOVE making Halloween cards. I think it's because of the colors that it's become one of my favorites. If I don't use the card to send out to someone I take it and pop it onto a scrapbook layout, this way they never go to waste. This cutie is called Sitting Witchy Poo with Pumpkin from High Hopes Rubber Stamps. Thanks for popping by today, hope to see you back soon!